We seem to have some kind of wood borer in an old kitchen hutch door. The holes are small and we’ve only found 1 active borer so far but I want to get this treated. I’ve been looking on your site and believe Boracare is the way to go. My question is will it penetrate a couple of inches? These doors are just 1 inch thick but the base and sides of the cabinet are thick. Some areas might be 2-3 inches wide and I can only treat from one side. I’m afraid the Boracare won’t get deep enough into these sections so let me know if there is something else I should use. Generally speaking, BORACARE will be your best option when you can use it. As you probably read on our product page, you’ll need the wood being treated to be unfinished since Boracare will not penetrate through a finished surface. So if there is shellac or varnish applied to all sides of the wood, using Boracare would not be an option. The general rule here is simple: if the wood will absorb water, it will absorb Boracare. We get asked a lot about various stains and other treatments but really the only way to know for sure is to test a small area by putting water on it. If the water beads up and rolls away, it means the wood has a protective cover on it that will limit or eliminate the Boracare option. As for how much deep Boracare will penetrate; 1-2 inches is the general depth it will go after one coat. 2-3 inches if you give it a second coat and up to 4 inches if you give it 3 treatments. Be sure to tive it a few hours in between treatments if you want to give it multiple applications. And then you need to let it cure at least 72 hours before finishing the wood. We generally recommend at least 2 weeks to make sure there is no moisture “trapped” under the finish. Using a varnish or other clear protective finish too soon can result in a “cloudy” look to it if there is trapped moisture so let it dry thoroughly. 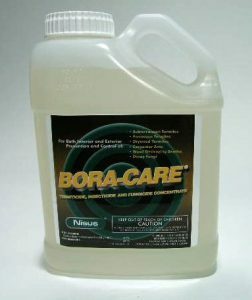 One gallon of Boracare will mix with one gallon of water and can cover up to 500+ sq/ft per gallon. Assuming your hutch is “average” size, you would expect to use 16-32 oz of Boracare mixed with 1-2 parts water. The treatment can be sprayed on but painting furniture is usually a more efficient to treat. Using a paint brush will result in less waste and a more precise treatment but to save time, you could opt to saturate it using a sprayer to save time. For a furniture or statues that are stained or finished on both sides, you’ll need to use either JECTA GEL or FS MP AEROSOL. Jecta Gel uses the same boron based active as Boracare. The gel is thick and comes in a “caulking” tube so you can inject the gel into holes you drill into the piece. We have details on how to space out the holes including how far apart they need to be, how many you’ll need per foot, etc. on our JECTA GEL PRODUCT PAGE. Basically the holes needed will be in the 3/8th to 1/2″ range and deep enough so they almost go all the way through to the other side. 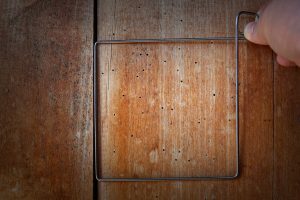 These holes can be made in discreet locations so after you treat, you can seal them with a wood dowel and make the area look cosmetically “normal” again. Like Boracare, Jecta Gel is odorless and treatments will last 5-10 years if not longer. 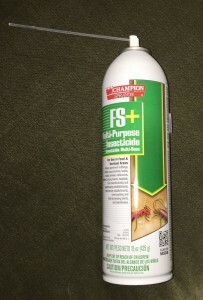 For really small jobs or when you need the most discreet application option possible, FS MP AEROSOL is a good choice. It uses a highly invasive penetrating solvent system so applications to holes you drill will move up to 2 inches in all directions. The holes needed for the injection tube need only be 7/64th of an inch wide so that’s less than 1/8th of an inch. 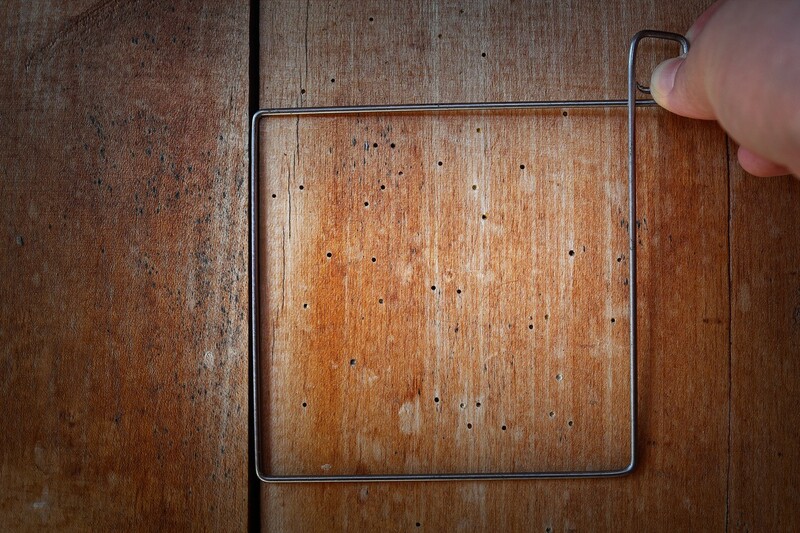 Space holes 4″ apart and treat them at least 3 times to ensure you get enough product distributed. You can often use old exit holes too reducing the amount of holes you must drill since they’re usually deep enough and plentiful and the injecting straw will fit well enough into their opening. FS MP does have an odor. Similar to WD-40, the fumes will dissipate in a few hours. Treat the piece outside when possible to allow the smell to volatilize and disappear fast. If treating in the home, open windows or run fans to let the piece dry and allow the scent to evaporate away.